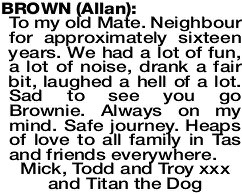 To my old Mate. Neighbour for approximately sixteen years. We had a lot of fun, a lot of noise, drank a fair bit, laughed a hell of a lot. Sad to see you go Brownie. Always on my mind. Safe journey. Heaps of love to all family in Tas and friends everywhere.